This great miracle worker and martyr lived in the latter part of the third century A.D. during Diocletian's rule of the Roman Empire. He originally came from the area of Cappadocia and was raised by very pious parents. When Diocletian started his persecutions against the Christians, St. George declared himself to be a Christian and thus denied the false idols. He suffered many tortures because of his belief, but never considered renouncing it. 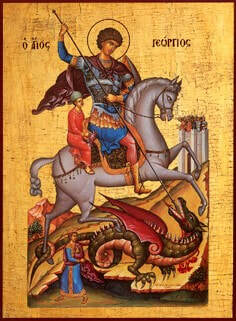 The life of St. George is a prime example of the life that each Christian should follow to obtain salvation. St. George the Great-martyr, was raised a Christian. His father was martyred for the faith. After his father's death, his mother took him to Palestine, where she had farm land. At a young age, he served in the Roman army under Emperoro Diocletian and was commended many times for his service to the Empire.From the rule of the Emperor Decian until 284 A.D., when Diocletian became emperor, the Church went through a period of peace and prosperity. Christians obtained important positions in the government during that time; many built churches and schools and organized the authoritative structure of the Church. Diocletian gave many of his loyal officers political positions so that he could have the military strength of his Empire on his side. After Diocletian had suppressed the barbarian tribes which were attacking the Empire and after he had secured its borders, he began to concentrate on the Empire's internal affairs. Diocletian believed that a state religion could keep the empire united. Since paganism was the state religion, Diocletian focused his efforts toward the suppression of Christianity. During the year 303 A.D., Diocletian summoned his aides to meet in Caesarea, a city of the Eastern Roman Empire. He held three general meetings with his aides, instructing them to persecute the Christians. St. George, since he had shown his excellence while serving in the army, was among these aides. Diocletian asked them to pledge their allegiance to this cause by making pagan sacrifices as proof of their loyalty. All the aides pledged their loyalty except St. George. He stood in front of Diocletain and admitted his belief in Christianity, telling the monarch of the Christian teachings and the Godliness of the crucified Nazarene. The emperor orderd this Christian be taken to prison and that a boulder be placed on his chest as a form of torture. The next morning Diocletian ordered that the prisoner be brought before him for questioning. George stood steadfast and told Diocletain of his belief in the riches of the Kingdom of Heaven. The emperor then summoned the executioners to take the saint and have him bound to the rim of a wheel set with sharp spikes. Diocletian admired the courage of the saint and asked him to sacrifice to the gods to save himself. He refused Diocletian's request and welcomed the chance to martyr for Christ, as his father had done. After praying to God, he heard a voice from heaven say, "Do not fear, George, I am with you." With the help of Christ, the spiked wheel had no effect on St. George. When the saint appeared before Diocletian not only was he unharmed, but an angelic aura had settled about him. Suddenly, two officers of the Roman army, Anatolios and Protoeon, appeared before Diocletian with two thousand soldiers. They admitted their belief in Christ and Dioceletain had them all executed. "As the deliverer of captives and defender of the poor, healer of the infirm and champion of kings, victorious great martyr George intercede with Christ our God for our souls salvation. "